By now, we’ve all either read the research or discovered on our own that the traditional method of teaching spelling isn’t effective for the majority of students. But differentiating is time consuming, and requires a TON of work by the teacher, right? Wrong! This year, I’ve found a way to use what’s already provided for me to quickly and easily differentiate spelling instruction in my class. My students and I love it, and I think you will too! Why differentiate your spelling instruction? See if any of this sounds familiar. 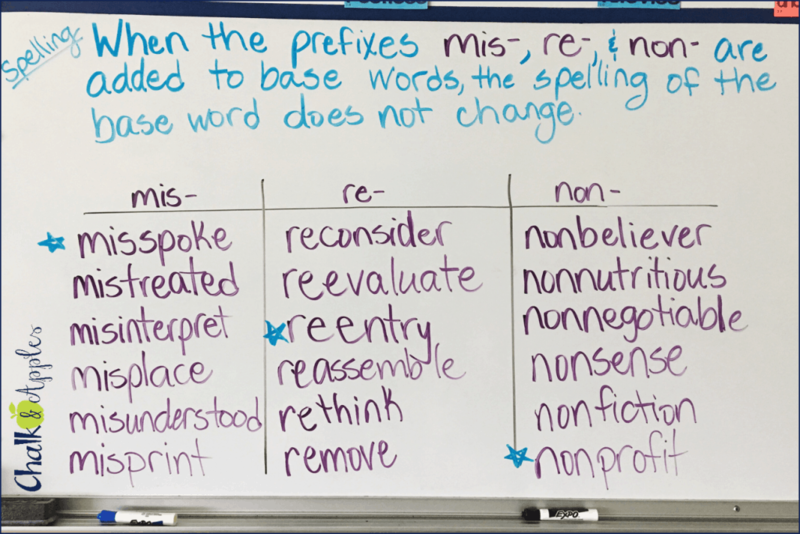 On Monday, students take a spelling pretest on the 20 spelling words provided by some boxed curriculum. Some students get all of the words correct, and now know they can check out for the week. others miss almost every word, and are left feeling like there’s no way they can succeed. Tuesday through Thursday follow with an assortment of worksheets. Then on Friday, the same test is given, this time for a grade. Other than the naturally good spellers, most students memorize the words for the test and promptly forget them. The solution is differentiating your spelling instruction, just like you’d do with reading or math. It doesn’t have to be time consuming for you, the teacher, though. You can use what you already have access to, and have students doing most of the work! Our basal reading curriculum provides a spelling skill lesson each week. I use this lesson, and the provided word list as the basis of my instruction. On Monday morning, I write the spelling skill statement on the board, and students copy it into their spelling notebooks. I also make a chart for us to sort our words by their spelling patterns. Our basal includes a spelling sort each week, so I use these same categories for my chart. I provide one or two words for each spelling pattern, and let students help come up with the rest of the words. I simply ask students what other words they know with this sound/spelling pattern. I continue taking words until there are 25 or so total words on the chart. If students have trouble coming up with words, I fall back on the provided list in the basal series for examples. Next, I give students a few “must do” words for the week, ideally one for each spelling pattern. They then fill in the rest of their spelling list with words from our chart that they don’t already know how to spell. Choosing their own spelling list gives students choice and promotes taking ownership of their learning. We’ve had several conversations about choosing words that will appropriately challenge them, and for the most part, my students do a great job with this. Students do a spelling practice activity from my Word Work for Big Kids: Spelling pack each morning for morning work. In the beginning of the year, I introduce one activity a day, and students complete that activity. Once students know 5-10 activities, they are free to do any activity of their choice. On Thursdays, many of my students choose to do a spelling practice test with a partner so that they know which words need more attention. Students take their spelling test on Fridays. Since everyone has an individualized spelling list, students take a partner spelling test. I assign spelling partners (they stay the same all year, unless I need to change them). I pair my spellers with like abilities, so that they can read each others’ word lists. Students give their partner a spelling test using their individual word lists. When both are finished, students correct their partner’s test. Students only mark correct or incorrect, and bring the papers to me for a grade. I always double check the grading, but it’s quick, since they’ve already marked them. Like this idea, but want more info? 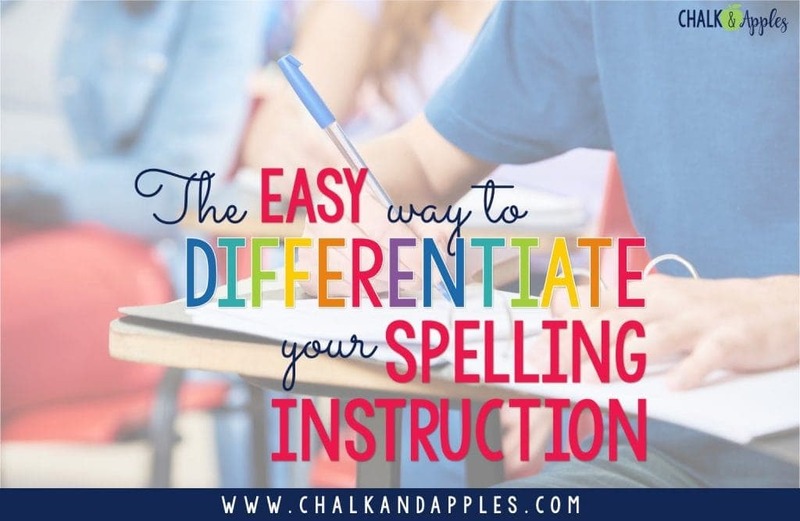 I’d love to email you detailed instructions for running differentiated spelling in your classroom! FREE Guide to Quick & Easy Differentiated Spelling! 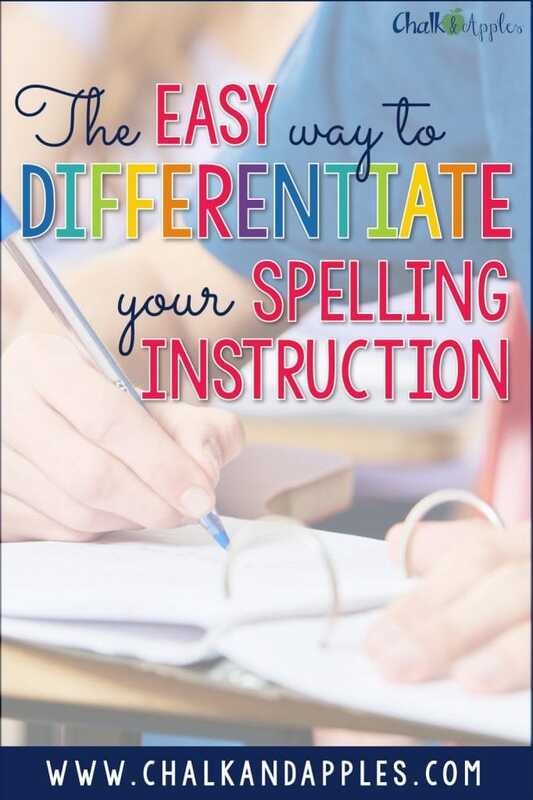 This FREE Guide to Quick & Easy Differentiated Spelling includes all the instructions, a complete sample lesson, and the only two printables you’ll need for an entire year of differentiated spelling instruction! I’d love to hear how you’re differentiating instruction using the resources that are already available at your school! Let me know in the comments! « 12 Days of Christmas Freebies! I am subscribed and got free sample! Kristen, I am teaching 3rd grade for the first time this year! I would like to do differentiated spelling and love your approach. My question is, how many words do you require you students to have on their lists?